Riventi is based in Burgos (Spain) since 2000, although its trajectory goes a long time back, to the professional beginnings of its forefather and founder, Adelaido Rilova Bustillo. After working as project designer in an industry from Barcelona, dedicated to the manufacture of metal pieces, Adelaido Rilova ended up in Prefabricados Metálicos Umaran, one of the pioneer and leading Spanish companies in façade engineering. Thanks to his talent and hard-working capability, Rilova managed to take part in the firm’s projects team. In the 1970’s, Adelaido became team manager, being responsible for over 25 people, working on very significant projects such as the Colón Towers in Madrid. Adelaido led the entire project development, working closely with the architects, until its actual implementation. He directed several worldwide and recognized works. Adelaido, already as I+D project manager, had a dream: creating his very own firm. But Ángel Umaran did not want to lose one of his most valuable workers, so they came to the agreement of creating a co-owned company: Rilova Fachadas Ligeras S.A. For more than a decade, Adelaido achieved a great success in several major projects throughout Spain, with a large number of assembled façades. However, Umaran’s passing triggered a large crisis for the corporation. 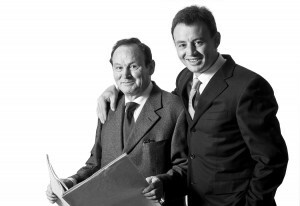 In 2000, Adelaido and his sons founded Riventi, achieving a great recognition all over the country and carrying out works of international prestige. Riventi developed a unique modular façade system, which integrates practicable joinery towards the interior. Riventi’s modular façade system allows covering fast and efficiently vast façade surfaces. Riventi has always focused on innovative solutions, allowing us to be a leader in the sector. This is reflected in the National Heritage General Direction in Madrid, which obtained de Best Glass-sheet Façade Award in 2014.